Germany is a vast country in Western Europe, sharing borders with nine European countries. Whether you arrive in Germany by train or plane, hiring one of our cheap cars in Germany is the ideal way to discover stunning scenery and vibrant cities abundant with history. Explore the various regions of Germany, before taking a grand driving tour of Europe in neighbouring Switzerland, France, Italy or Austria. Rent a low-cost car on arrival at Munich International Airport (MUC) to spend time in Munich (München), the capital of Bavaria, known for its legendary Oktoberfest, Olympia Park where the 1972 Olympic Games were held and on a lesser note, for the concentration camp at Dachau. From Munich, drive to Stuttgart and pay a visit to the Mercedes-Benz factory and the Porsche and Mercedes-Benz car museums, before driving northwards to Heidelberg, a world-renowned university city. Take a stroll around the old city (Altstadt), walk up the hill to its beautiful Old Castle or take the mountain railway (The Bergbahn). The Belvedere Terrace will offer you a breathtaking view over the old town and the Neckar river bridge. Driving north of Heidelberg will bring you to Frankfurt, a city where well-preserved ancient buildings stand next to the highest skyscrapers in Europe. Frankfurt is a very lively city reputed for its trade fairs such as Frankfurt Motor Show. Drive eastwards along the Rhine River, through the Rhine Valley and via the cities of Mainz, Bingen, Koblenz, Bonn, Cologne and Düsseldorf, or fly directly to Cologne/Bonn Airport (Flughafen Köln/Bonn). Rent one of our cheap cars in Cologne and explore the city, or head to the northern cities of Hanover and Bremen, or to the Baltic Sea Coast. Discover the cities of Lübeck, Kiel, and Stralsund, or head to the island of Rügen and the beautiful lakes of Mecklenburg region. On your arrival in Berlin, the capital city of Germany, you can hire your cheap car at Berlin Tegel Airport (TXL) or at various locations across Berlin. 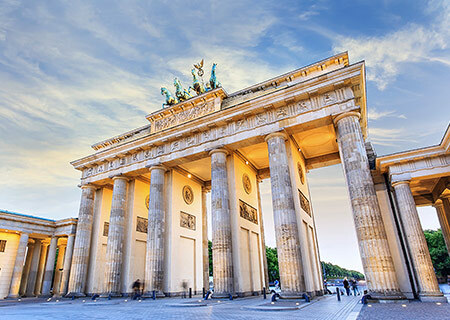 Tour Berlin’s historical centre or "the Mitte", once part of East Berlin, which includes political institutions such as the Reichstag, the Rotes Rathaus, the famous Boulevard Unter den Linden and the Brandenburg Gate. Don’t forget to pass through the iconic Checkpoint Charlie between the old West Berlin and East Berlin, spend time at the magnificent Museum Island (Museumsinsel) and enjoy the atmosphere of Europe’s most vibrant city. With a well-managed road network, driving on Germany’s autobahns and scenic roads is a joy, and renting a cheap car in Germany is the ideal way to discover the history, culture and landscapes of this fascinating European country. Bingo Car Rental is the place to come if you are looking for cheap car rental in Germany. For a family vacation or road trip with friends, hiring a car is often the cheapest way to get around, giving you the freedom and flexibility to explore at your will. Find out how you can keep your rental costs to a minimum when you search online with Bingo Car Rental, so that you make big savings on your holiday. We are able to present you with prices that are up to 30% cheaper than renting the same cars directly from the car rental company, and by comparing prices from the leading car rental agencies such as Avis, Sixt and Europcar, we ensure you get the rental car you are looking for at the lowest rates available online. A compact car, supermini or small city car… whatever name you give it, this is the most economical car you can rent in Germany. Ideal for couples, small families or city driving, not only are compact city cars the cheapest rental category, you will also find that these simple little run around cars keep fuel costs to a minimum. Look out for cars that deliver a good fuel economy (65 mpg being a good return, 80mpg is excellent), such as the manual transmission Volkswagen Polo with a diesel engine that delivers 74.3mpg or the Peugeot 308 Hdi, a great little small family car that delivers an impressive 79mpg. The Peugeot 107 and the Toyota Aygo are also reliable low price small cars, so choose a supermini with excellent fuel efficiency and find out for yourself how much money you can save. If you are travelling with a family and luggage, or are planning to travel long distances, a mid-size or full-size car is what you need. You can find cheap mid-size cars to hire in Germany, including the Toyota Auris Hybrid and the sporty Hyundai i30 automatic tdi. The larger Toyota Prius Hybrid is also a good option, delivering an impressive fuel economy of 83.1mpg, saving you money on your gas. Other cheaper full-size cars include the Volkswagen Passat and the Mercedes C Class, giving you the space and comfort you need for a long journey whilst you reduce rental costs and petrol consumption. Renting a Minivan or People Carrier in Germany is the cheapest way to transport 8 or more people, and you can take advantage of the great deals that Bingo Car Rental can offer online. The Chevrolet Spin is a simple yet stylish and comfortable 8 passenger MPV, the 9 seater diesel Fiat Scudo is an economical minivan, whilst for larger groups, the 12 seater Hyundai H1 delivers a great performance and excellent fuel economy. If you are planning a long road trip or a weekend in the country, a Toyota Previa Campervan rental might be the cheapest option for you, providing you with the freedom to travel in comfort and style, as well as an affordable, comfortable and safe place to sleep.